Speed Limiters – ΜΕΤΡΙΚΗ Α.Ε. Cruise control, speed limitation and speed control. 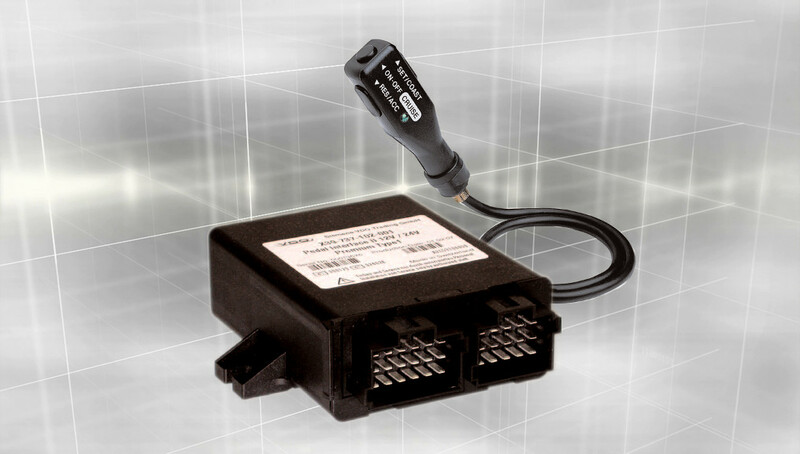 The VDO Pedal Interface II consists of an electronic controller which is mounted between the accelerator pedal unit and the engine control unit (ECU). The output signal of the accelerator pedal is modified to control the road and engine speed. Using one of the 3 cruise control stalk options any speed between 30 km/h and 200 km/h can be set. The speed set will then be maintained without actuation of the accelerator pedal. In addition a maximum road speed can be set with the control stalk, which cannot be overridden by the accelerator pedal. In addition to the Standard version, this version offers a maximum speed limitation programmed using the configuration software manager which cannot be adjusted by the user. This function fulfils the EU directive 92/6 for vehicles > 3,5t (road speed limiter). Other functions include additional speed limits activated by status inputs and a maximum engine speed limitation, which leads to fuel savings and a reduction of engine wear. Along side the features of the Standard and Enhanced versions the Pedal Interface II Premium version enables engine speed control. The engine speed can be controlled using several options: cable-remote control, the cruise control stalk or status inputs. The engine speed can be adjusted to a pre-selected values programmed within the configuration manager. The status inputs can also be used for a fuel limit function. This allows the accelerator pedal output signal to be limited to a preset % programmed using the configuration manager from 0% to 100%. It is possible to override the position limit with the cruise control function.